I sent off that custom order of Welcome to Brooklyn cards a few weeks ago (phew! ), and made sure to include a thank you card with the order. Once again I made use of my favorite coverplate die from Papertrey Ink, along with a thanks die from Wplus9. I used some fun foam behind the stripes before attaching them to my card base to give the card some dimension. 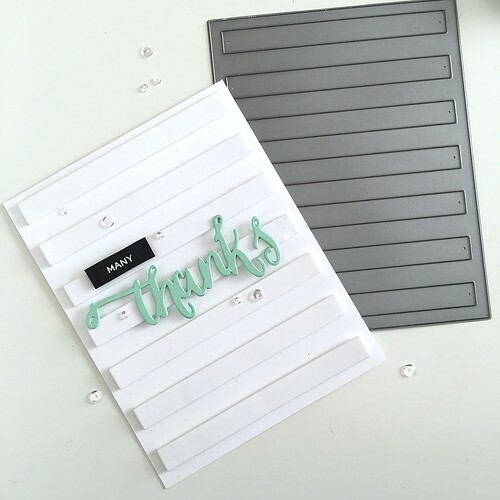 I cut the “thanks” several times from some mint cardstock and stacked them on top of each other to give the sentiment some oomph. I used the hand lettered thanks stamp set for the “many” which I white heat embossed onto a small strip of black cardstock. I added a few moonshine sequins to finish it all off!